The best MIDI keyboard controllers are making home music production unbelievably easy and fast. These units offer an element of tactility that makes interfacing with your music software more intuitive than hitting icons. Today, you can replicate a whole team’s work all by yourself. What’s more is that unlike a few years back, you no longer need a second mortgage to express your ideas through music. A fully functional midi controller like the Arturia MiniLab MkII costs way below 150 dollars. It still offers the basic features that you’d require from a midi controller. Whether you want to upgrade to an advanced model or you’re looking for the best MIDI controller for beginners, the list below has something for everyone. Just read on! in this review, our featured products are a mix of price, type and brand. 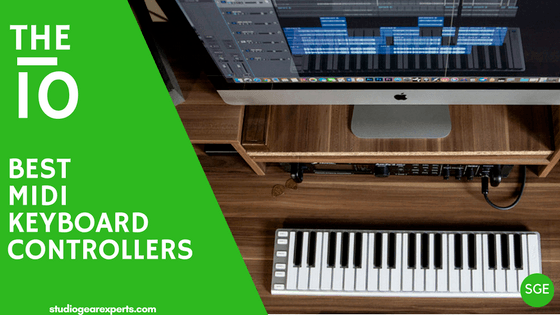 This is to ensure that whether you are looking for the best midi controller for beginners, for ableton fl studio, or a small and portable MIDI keyboard we have something for you. Nektar Impact LX25 is one of the most compact midi controllers in 2017. At its price- around 99 bucks- this model competes directly with the Arturia Minilab MKii and Alesis V Mini. Its size makes it the best midi controller for a small studio that wants something compact but versatile. It also fits in most luggage bags. You should, therefore, consider it if you want a small ad portable MIDI controller keyboard that you can frequently travel with. Despite its small size, LX25 packs everything that a budding musician would be looking for. Firstly, it gives you a 25-keybed that is quite enough for your musical riffs. The keys are synth action and full-size. They also have a medium-level tension that gives them a great feel and are super responsive. The control panel is a fully integrated one too. It’s quite impressive that you can find a cheap midi controller like this one with a 30-mm fader and 8 pads. What’s more appealing is that the controls are customizable. So they can send any Midi CC message you assign to them depending on what you do. About compatibility, Nektar Impact LX25+ works well with iOS, Mac, and Windows systems. Again, it’s designed to support several DAWs including Cubase, Bigwig, Digital Performer, Garageband, Logic, FL Studio, Nuendo, Reaper, Sonar, and others. At around the same price mark as Nektar Impact LX25+, the Arturia Minilab MkII is another highly recommendable unit on this list. This is a budget midi controller with just the basic controls that a beginner would require. To begin with, this Midi Controller measures 14 x 9 x 1.5 inches and weighs 1.8lbs only. These dimensions make it a great option for artists who travel a lot while working on their projects. It also fits easily in small studios and can also be placed on your laps. Besides being compact, Arturia MkII is also rugged and safe to carry to and from gigs. Amazingly, Arturia has not compromised this controller’s functionality in a bid to deliver something small. This model packs 25 slim keys, 8 pads, and 16 knobs for easy tweaking of your music sounds. You also get access to hundreds of musical instruments. The good news is that this Midi controller for starters comes fitted with the critically acclaimed Ableton’s Live Lite platform- real value for your money here! It also comes with other essential musical software including Analog Lab Lite and Grand Piano. As a music producer, there are times when you’ll want to record your music as soon as it hits your mind. You'll require a MIDI controller that allows you to do that wherever you are at no matter what time. IP-IRIG-KEYSLGT-IN is one of IK Multimedia’s most recommendable model in this category. The major reason why IK Multimedia Irig deserves to be mentioned in this list of the best MIDI controllers 2017 is its great compatibility. This controller supports Android, Mac, Pac, iPhones, and iPads. So you can work on your projects wherever any of these devices go. It’s a 37-key Midi controller with velocity-sensitive keys that make composing songs and performing with the MIDI controller unbelievably easy. It also has mod wheels and a pitch bend to make its playability more expressive. Notably, Irig also has an input for your sustain and expression pedals (for those who use them). To sum it up, this model comes with backlit buttons so you can still use it in the dark. The package also includes SampleTank 3-SE (which can be downloaded from IK’s user area) for your PC and Mac, The Grid, and 5 collections from Electronika and The Beats series for iPhones and iPads. M-Audio is breathing new life into computer music production with their new series; Oxygen. This series has 25-key, 49-key, and 61-key MIDIs depending on every musician’s needs. The 49-key model offers more control and deep software integration in a reliable build that makes it possible to record music on the go. This controller has a mind-blowing set of controls that have been streamlined and divided neatly into sections to make them reachable and easy to use. Mind you, you’ll never reach for the mouse with this controller. Its assignable knobs, faders, and pads offers superb control over your DAW by keeping you engaged throughout the process of recording or mixing your music. Its 49 keys are semi-weighted. They are velocity-sensitive and, therefore, great for playing bass lines, melodies, and chords. It also has 8 assignable knobs that you can use to tweak your virtual instruments and plug-ins. Oxygen 49 also boasts a set of 8 velocity-sensitive pads for drumming and triggering samples, and 9 faders (assignable too) for mixing tracks. Akai’s MPK249 is a flagship Midi controller made with professional artists in mind. It’s an inspirational performance pad and keyboard controller offering an integration of MPC’s iconic music production technologies and enhanced workflow. The MPK249 is a bit more advanced than the models we’ve reviewed thus far. So let not its price tag steer you away. Like most Midi controllers from Akai Pro’s MPK series, the MPK249 is a jam-packed unit. It features a fully integrated interface made purposely for manipulating virtual instruments, DAWs, and effect plug-ins. This device is designed to offer you plug-and-play connectivity with Mac and PC. As the name suggests, it has 49 full-size semi-weighted keys all which have pressure sensitivity for after-touch. It also comes armed with 8 assignable knobs, switches, faders, and 16 pads with RGB feedback. It also has 3 banks that boost the number of assignable knobs, switches, and faders all the way to 24 each. There are also other 4 pad banks that up to the number of pads to 64 depending on how versatile you want the midi controller to be. Novation Impulse is Novation’s latest addition in the world of Midi Controllers. These keyboards are available in 25, 49, and 61 keys. For those who want to enjoy from both worlds, the 49-key controller is the way to go. Professional music producers and DJs are raving about this Midi controller. If you are just upgrading from a smaller unit and don’t want to spend a huge chunk of money on a high-end model, this one should top your list. It has an excellent solid build and several top notch features at almost half the price of what its competitors cost. Similar to its other siblings, this midi controller features a precision keyboard. The keys are semi-weighted and have assignable aftertouch. One thing that makes this best midi controller in 2017 is its accuracy and effectiveness. It reflects your actions and performance accurately using whichever software instrument or synth you trigger. It also has a full control surface that gives you an easy time when using the DAW and plug-ins. Like other Midi controllers in this series, Novation Impulse 49 includes Automap control software that makes it easy to control faders, buttons, and knobs. Its 8 knobs are always linked to any software instrument or effect. You can control other things instantly by pressing LEARN followed by the control button. Alesis V is even simpler to use than the Nektar Impact LX25+ and Arturia Minilab MKII that we’ve reviewed earlier. One thing that stands out with the Alesis V is the tons of features that have been tucked in it and its unbelievable price tag. At below 50 bucks, we didn’t expect this midi controller to offer much. However, Alesis V brings you 25 velocity sensitive keys, pitch bend, modulation, and sustain buttons, and octave controls all that are found on bigger keyboards. These buttons expand your expressive performance capabilities. This midi controller also has 4 assignable knobs that you can use to manipulate your virtual instruments and musical effects. You can use these knobs to open and close filters, activate effects, and adjust volume levels among other things. i 4 backlit pads that you can use to launch your clips. The pads are velocity-sensitive and, therefore, perfect for finger drumming. To make the deal even sweeter for you, Alesis have worked closely with Air Music Tech to include Xpand!2 into this controller. This is a powerful and intuitive DAW that comes with 3000+ fully editable presets for beginner musicians. Alesis V also offers free V mini Editor that allows you to download and manage your own presets. Is Ableton Live your favorite music production DAW? Are you looking for the best MIDI controller for it? Look no further than Novation’s Launchkey 49. This midi controller has been designed to work directly with this software. This controller has velocity-sensitive RGB pads, faders, and knobs that give you the freedom to shape your music as you’d like it. You can launch clips, play beats, and control FX via its 16 pads. To make it more like your Ableton Live session view, Novation has laid out the 16 pads in 2 rows of 8 pads. One row is used to launch clips while the other row stops them. Amazingly, these pads have full-color RGB LEDs that make it easy to note the clip that you’ve employed at a glance. Novation Launchkey 49 Midi controller isn’t the most compact model. However, it's not so huge to travel around with. It has a solid and tank-like construction so you can use it anywhere. Its sweetspot is that it does not require power cables or drivers to function. It’s class compliant and relies USB bus-powering from either a Mac or PC. M-Audio Keystation 49 II is hands down, the cheapest 49 key midi controller in our reviews. M-Audio brings you a keyboard with more playability than the 25-key units in a unit with a small footprint. This instrument is lightweight and durable. To give a portable setup, this Midi controller is class-complaint, USB-powered, and also supports iOS connectivity. This allows you to use it with iPad and iPhone devices provided you have compatible audio apps installed. As such, it’s a great option for professional traveling musicians who want to record their hits wherever the inspiration hits you. True to its name, Keystation 49 II brings 49 velocity-sensitive, synth-action keys that have a smooth feel for expressive playability. These keybed has a natural feel and lets you command the Digital Audio Workstation expressively when recording hits or performing live. This MIDI controller features a versatile slider that can be assigned to work as a data up/down, music platform transport controls, volume control, and modulation and pitch-bend wheels. These controls expand your expressive capabilities and playable notes without the need of using a trackpad or mouse. What’s more, this MIDI controller comes with a ¼’’ sustain pedal input for those who would like to add genuine piano sustain into the equation. Akai MPK Mini MKII is one of the best midi controllers below 100 on the market today. It’s also one of the most compact computer keyboards that we came across. So if you consider portability a MUST on the ideal midi controller, this one needs to top your list. Almost everything has been scaled down for optimum portability. By this, I don’t mean its entire size only; I also mean the keys. They are way smaller (the size of a penny) and have almost no weight. Professional players who are used to full-sized pianos and those with big hands may find it a bit hard to deal with this one. Fortunately, the keys are velocity-sensitive which means that their velocity depends on how soft or hard you hit them. This super compact Midi controller also brings you awesome pads. These pads have had a great improvement from those of the previous model. These one are made of thick rubber. Their matte-like surface and excellent build-quality make it easy to trigger drum sounds. Though most professional studio experts still do without them, midi controllers have an important role in music production. Importantly, you need not be a piano expert to make use of their versatility. You can use them to make anything from simple music patterns to virtuoso records. What matters is choosing the best midi controller for your needs. Like any other studio equipment, don’t think that you can just grab any MIDI controller off the shelf and expect it to work as you would wish. There are several considerations and decisions to make as you’ll soon find out. It all begins here. Different MIDI controllers have a varying number of keys depending on your needs. A real keyboard controller has 88 keys while the most compact offers 25. You can also get anything in between- 32, 37, 49, 61, and 76. If you want to play full piano arrangements, a controller with 61, 76, or all the 88 keys is what you need. If your budget allows, it’s always advisable to go with full-size keyboards with 61, 76, or all the 88 keys. However, for one-handed synth leads and basses, a compact controller with 25 keys is just enough. Midi controllers with 49 keys are the most common. This is because they allow 2-handed playing and have a small footprint for your studio desks and on-the-road use. Key-make: After determining the number of keys you require for your midi keyboard, the second consideration is to choose how the keys respond to your touch. Here you’ll have to choose between fully weighted, semi-weighted and unweighted/synth action keys. Fully weighted keys- these keys are most common with expensive midi controllers. They emulate the feel of an acoustic keyboard given their heavy feel. Therefore, they require some amount of force and finger independence to drive the key all the way down. Midi keyboards with fully-weighted keys also tend to be heavy. Semi-weighted keys- True to their name, these keys offer mid-level resistance. These keys are your best bet if you want a keyboard with light keys that require some amount of pressure (a little higher than that required in unweighted keys). These keys are common with professional midi controllers. Unweighted/synth action keys- these keys require the least amount of pressure to cause action. Unlike the other 2 models, these keys don’t use actual weights. They employ springs to push the keys up after being pressed down. As such, they are lighter and fast. They are found on most entry-level keyboards and can be used in most music genres. Thanks to technology, the latest midi controllers have pads that allow you to play drum beats and other repercussion sounds. You’ll find keyboards with 8, 12, and 16 performance pads for launching loops and beats. This is an easy way of consolidating more of your studio tools into one unit. What additional features are you looking for? The best midi controllers with additional functions like faders, arpeggiators, pitch bend wheels, and buttons add a punch to your playability. You need not kill yourself for these add-ons, but they are awesome to have onboard. If you don’t have one already, you may also consider whether the controller comes bundled with a Digital Audio Workstation or not. If not, consider going for a controller that works great with your music software.